Unlike other species of cartilaginous fish such as sharks, manta rays show to be a little more tolerant to human presence. Some divers mention that these gentle giant fish swim around them in a slow and graceful shape, and wonder whether they are the ones being observed. How has been the relationship of humans with manta rays? We can say that the knowledge we have about them is still very small, like the tip of an iceberg. They are difficult to study in the wild, and rarely venture into the sea. However, scientists often see them usually around reefs, atolls and islands, at depths of up to 30 meters. Decades ago, many people thought that these fish were highly dangerous creatures capable of killing people. Even today circulate stories about manta rays that “stung” the unsuspecting swimmer or fisherman, but remember they lack a poisonous sting, so these cannot be manta rays. They could hardly hide their body in the sand of the beaches. One of the reasons for establishing a relationship with the manta rays is the need to understand their biology and behavior. Thanks to the studies the two species known today were identified, and plans to investigate in depth the relationship between their huge brains (the largest of all bony fish!) And their intelligence, because so far it’s unknown how smart they are. It is true that their behavior in the presence of humans has been barely studied, but when divers swim with them, there has been some curiosity and interest on their part, without showing a tendency to direct interaction. Many divers mention that swimming with these fish conveys a sense of peace and balance, while they beat their “wings” in a slow and measured way. Some areas and marine sanctuaries offer the experience of swimming with manta rays to people who are not scientists or researchers. Some of these sites are found in Indonesia, Hawaii, Fiji, Thailand and Australia. Indonesia, for example, has found that higher income can be achieved through tourism activities with manta rays than what illegal trade can bring, and has created strict laws against fishing for these fish. 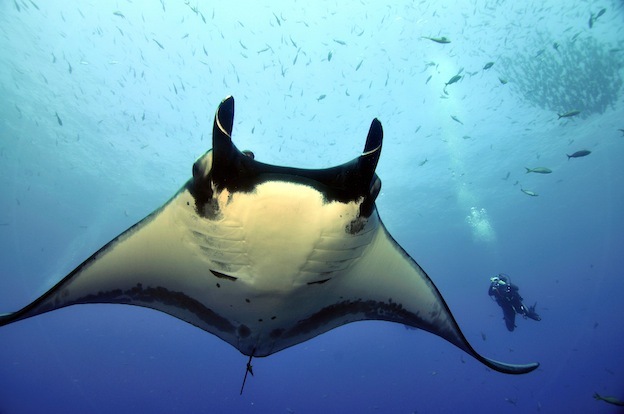 Swimming with manta rays involves measures to avoid disturbing these animals. Although they don’t seem to feel threatened or fearful of humans, it is recommended to avoid touching them and above all riding them. However, some can show discomfort if a person gets too close, and tend to shy away. This happened around a Pacific island called Bora Bora, where the population swam away by the effect of excess divers, swimmers and boats in motion. Manta rays in captivity are not very common, since for their care it is necessary to keep water tanks large enough for their body and a deep knowledge of their biological needs. Only some aquariums have successfully maintained manta rays, including the Churaumi Aquarium of Okinawa, Japan, the Georgia Aquarium in Georgia, USA, and uShaka Marine World in Durban, South Africa. The latter aquarium drew attention in 2007 for rehabilitating and housing a manta rescued from a network of sharks. However, Nandi, as it was named grew too much and its permanence in UShaka became a concern, until it was transferred to the Georgia Aquarium. In September 2009, a second manta ray was exhibited and a year later a third. For its part, the Japanese aquarium became the birthplace of the first manta ray in captivity and two more have been born right there, something with no equal in the world.